Stock Android 5.0 Lollipop AOSP ROM is now available for the Xiaomi Mi3 Android smartphone. In this guide we’ll show you how to install the same on your Mi3 phone. The ROM is based on the latest Android 5.0 Lollipop OS but it is not a final version and has some minor bugs. To get started first you have take the full backup of you device, after flashing this ROM you will lose all you data so do take the backup. Once you done that you have to install the CWM recovery on your device and after that you have to Flash the ROM file and Google apps. The guide is pretty simple and take a few minutes to complete. Read all the below mention instruction carefully and follow all the steps one by one on your Xiaomi Mi3 phone. It’s recommended to backup your important data. 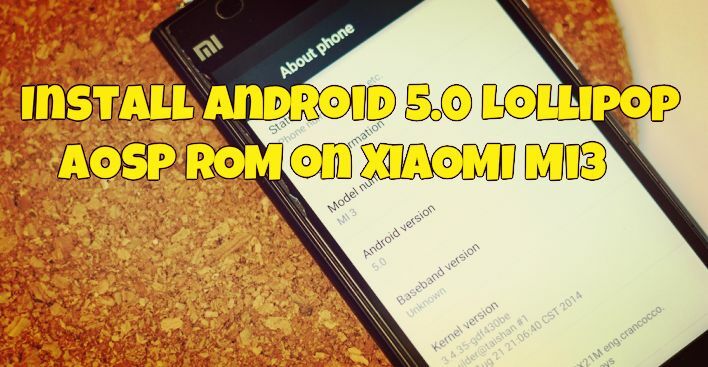 Lets take a look how to Install Android 5.0 Lollipop AOSP ROM on Xiaomi Mi 3. Step 1. Download the CWM Recovery here and save it on your desktop. Step 3. Now move all the three file on your phone. Step 4. First you have to flash the CWM recovery on your phone, to do this open the updater app, press menu button and then click “select update package”. Select the ‘CWM_recovery_r11_cancro.zip’ and install it. Step 5. After this boot you phone in recovery mode. Go to Tools > Updater > press Menu key and select ‘Reboot to Recovery mode’. Step 6. Now form the CWM recovery, Select ‘Wipe data/ factory reset’ and confirm to wipe. (Wiping may take sometime). Select ‘Wipe cache partition’ and confirm. Now go to advanced and ‘wipe dalvik cache’. Step 7. Now go back and Select ‘Install Zip’ and Select ‘choose zip from /sdcard’, then 0/ and then choose the ‘aosp-cancro-4.12.8-kQ1vi7iZhK-5.0.zip’ file. Then install it to System 1. Step 8. Now install Google Apps for Android 5.0 (GAPPS), Go back and install the ‘gapps-lp-20141109-signed.zip’ file to System 1. Step 9. After this Reboot you phone to system 1. First reboot will take some time and if you are stuck on the Loo screen then switch you phone and power on again. Now you phone is running on the Android 5.0 Lollipop.